Prepare waffle recipe listed on baking mix box, adding cinnamon. 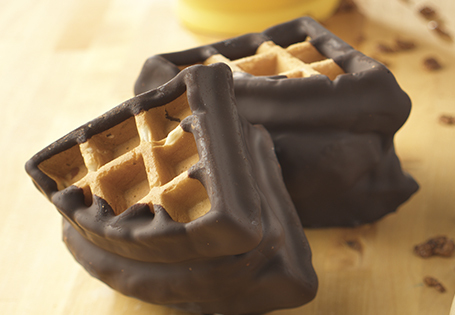 Cook waffles and break into quarters; reserve waffles in refrigerator. Measure out four ½-cup portions of ice cream; shape into triangles about the same size as the waffle quarters. Sandwich ice cream in between 2 waffles; reserve in freezer. In a double boiler, melt chocolate until smooth; dip all three edges of sandwich into chocolate and return to freezer until chocolate has set. TIP: For a sweeter sandwich, dip in milk chocolate.